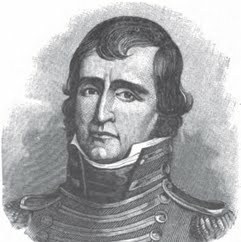 Major Joseph Hamilton Daveiss commanded the Dragoons of the Indiana Militia at the Battle of Tippecanoe. Although the correct spelling of his name appears to be "Daveiss", it is uniformly spelled "Daviess" in places named for him. Daveiss was born on March 4, 1774, in Bedford County, Virginia. He moved at a young age with his parents to Kentucky, eventually settling near Danville, Kentucky. Admitted to the Kentucky bar in 1795, he appeared in court dressed as a backwoodsman. He served as a second in a duel in 1799, and was for a time a fugitive. Daveiss eventually defended his principal in court, and achieved an acquittal. Daveiss is said to have been the first lawyer west of the Appalachian Mountains to argue a case before the United States Supreme Court. He married Chief Justice John Marshall's sister Nancy, and returned to Kentucky. Daveiss served as United States District Attorney for Kentucky. He has been described as a "Kentucky Federalist". In February and March, 1806, he wrote President Thomas Jefferson several letters warning him of possible conspiratorial activities by Aaron Burr.